The worst has happened, and you have gum disease. What is next? You care for the gums to prevent further damage. But before we get to that, what causes gum disease? It is an infection the gum that leads to damage to the bone and eventually could cause your teeth to fall off. The most obvious indications of gum disease include swollen and painful gum, loose teeth, receding gum, and pus on the gum among others. When you fail to care for your teeth through daily brushing and flossing, plague will build up and harden to cause tartar. Even if you adopted better dental hygiene at this point, the tartar could only be removed by a dentist's procedure. Before plague builds up to this level, you want to start a proper routine that includes bi-annual visits to the dentist. After brushing your teeth with a soft brush, you may need to include mouthwash in that routine. Mouthwash meant for people with gum diseases is even better as it will be gentle while preventing further bacteria build up. To protect yourself even further, you will reduce your intake of sugary things. Sugar leads to bacteria build-up which is what you are trying to avoid, so keep off it as much as possible. If the gums are bleeding, apply pressure on the spot with a cold press. Smoking is not only harmful to your health, but bad for your teeth and gums too. 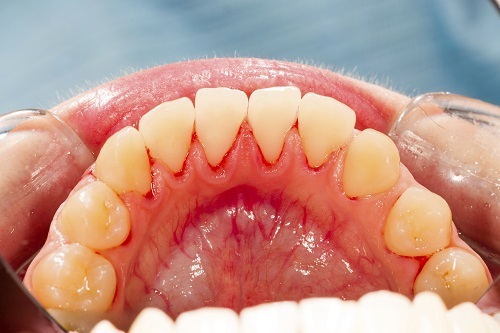 If you already have gum disease, keeping up with this habit will only accelerate it. You should see your dentist bi-annually, and they may even need to see you more often if the need be. We are at your service. Schedule an appointment today.